Many of the weapons are being smuggled through Oman, using overland routes across the “porous borders” between the two countries – an uncomfortable revelation, since Oman has been viewed as a U.S. ally. According to Reuters the government of Oman is not an active participant in supplying the Houthis with weapons, but is “turning a blind eye and aggressively failing to crack down on the flow. Warships from the US navy and Saudi-led coalition have intercepted four weapons shipments from Iran to Yemen since April 2015, a US admiral said on Thursday. Yemen has been rocked by war since Iran-backed Houthi rebels overran the capital Sanaa and other large parts of the country in 2014 and 2015, prompting military intervention by a Saudi-led coalition in support of the government. The UAE, which is a key member of the coalition, on Thursday welcomed a proposal by the United Nations envoy to Yemen to revive a political process to end the conflict. Ismail Ould Cheikh Ahmed submitted the proposal to the rebels in Sanaa on Tuesday. The contents have not been made public, but informed sources said it called for agreement on naming a new vice president after the rebels withdraw from the capital and other cities, and hand over heavy weapons to a third party. Yemeni president Abdrabu Mansur Hadi would then transfer power to this vice president who would appoint a new prime minister to form a government in which the north and south of Yemen would have equal representation. Mr Hadi’s government has so far been non-committal. 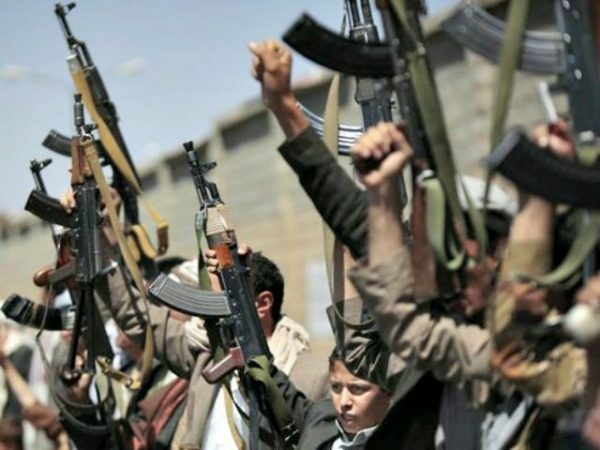 The United States and Saudi Arabia have accused Iran of arming the Houthis and the coalition has enforced maritime and air controls over Yemen. Tehran denies the charges. “Either US ships or coalition ships … intercepted four weapons shipments from Iran to Yemen,” said US Vice Admiral Kevin Donegan. Vice Admiral Donegan said the shipments contained thousands of AK-47 assault rifles, anti-tank missiles, sniper rifles and “other pieces of other equipment, higher-end weapons systems”. Naval officials were able to determine the destination of the boats’ by analysing GPS settings and interviewing the crew. One of the shipments had been validated by the United Nations as being an illegal weapons shipment, said Vice Admiral Donegan. The US military’s Central Command chief, General Joseph Votel, said last week that Iran may have played a role in suspected Houthi missile attacks against American warships in the Red Sea. “We believe that Iran is connected to this in some way,” Vice Admiral Donegan said. Given the heavy volume of traffic around the Strait of Hormuz and the Arabian Gulf, the three-star admiral said “plenty” of other shipments would have gone through to Yemen. The interceptions came after Iran, in April 2015, tried to send a convoy of seven ships, guarded by two Revolutionary Guard vessels, to Yemen. Vice Admiral Donegan said these ships were filled with coastal-defence cruise missiles, explosives and other weapons. So, just give all these weapons to the anti-Iranian forces in the meantime. But Mr. Tew … what if they decided to sell them for food?? Install one of these babies, and let the folks drop ’em in … then pass out Lollies. Kids will be entertained.